Babe Ruth is the most recognizable baseball player in the history of the sport. 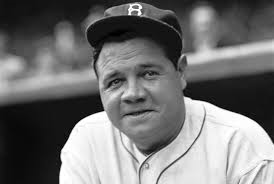 People can debate as to who was the greatest but the Babe will forever be the face of America’s Pastime and let’s be honest here, guys like Ty Cobb were incredible but Babe Ruth is the greatest baseball player to every step foot on a field. He had a career batting average of .342, 2,873 hits, and 2,213 RBI’s. He also hit 714 home runs when baseballs were essentially a rock wrapped in leather. Oh, and did we forget to mention his pitching record of 94-46 with an ERA of 2.28? The man is baseball. He loved what he did and it showed. Ruth was generous, kind, and looked out for others. Aside from what he did on the field, the Babe gave some of the greatest quotes. It was hard but we picked the best of the best, enjoy.